With over 60 years of experience in our team, we're able to offer the highest standards of service and support at competitive rates. Call us now on 01953 888444. The survey equipment company, working for you. As an independent and family run company we work for you, our customer, and not for target figures and spread sheets. We monitor what is new in the market and talk to suppliers to ensure that we sell you the equipment that is best for you, not for us. Our ultimate goal is to ensure you are happy so you tell others just how good we are, and we are! Our hire equipment is the same as we would sell, the product that we think represents value for money. 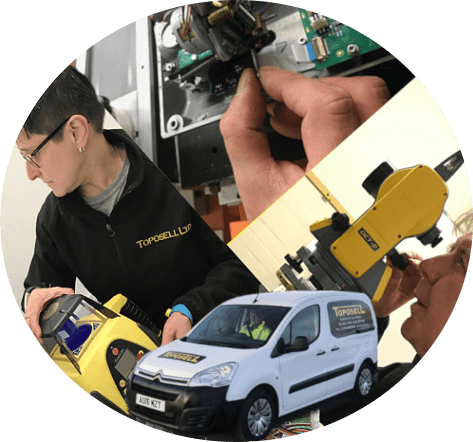 It may not be the cheapest, or the dearest, but it will be the most reliable, have the best back up and checked thoroughly before it leaves our premises. It will be delivered (unless otherwise requested) by our van and one of the team. We fix things, we don’t just change components until it works. We pride ourselves on our experience. Between them, Max and Ronnie have 60 years of relevant, hands on knowledge and expertise. To them it is not just a job, they treat your equipment as they would our own, keeping it accurate and working for as long as is possible, a rarity in today’s throw away world. The 3D printer is as much a daily tool to them now as the Osciliscope and the lathe. We don’t shout about how good we are but we hope you will. Our relationship with our suppliers is also very important and we are proud to be associated with Spectra for Lasers and Theodolites, Trimble for the Catalyst , Geomax for Robotic’s and Total Stations, Nedo for Levels, Tripods and Staff’s, Seco for Tapes and accessories, Topcon, Leica, Geo Fennel, BMI, Blue Diamond and Avancer for Parts, Brackets, Wheels and Paint to name but a few. Each bring their own special qualities to our portfolio.